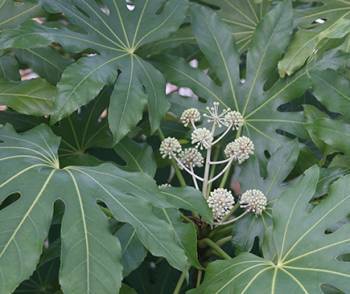 Fatsia japonica is an evergreen shrub which grows to about 2.5m high and has rather exotic and tropical looking leaves. It prefers a shaded position and will not thrive in full sun. They are strong growing plants and recover well even if treated badly. Some people call them the Umbrella Plant, others the False Castor Oil Plant because the leaves have a similar shape. Fatsia originate from Japan and Korea and produce slightly odd shaped white flowers in autumn. As well as being grown outside, these plants are frequently found in cool greenhouses, courtyards or conservatories. They are medium sized shrubs reaching a height and spread of 2m to 4m (7ft to 13ft) depending on the conditions. The leaves are evergreen and are the main interest point. They are large and adapted to growing in low light levels. Fatsia japonica produces unusual white flowers in late autumn, normally October to November time. They aren't particularly numerous and although they have novelty value, grow this plant for its leaves. They grow best in partial shade and tolerate full shade well. Avoid growing them in full sun. They are not fussy about soil conditions at all and will grow in all but the most extreme situations. In general an established Fatsia japonica is hardy down to -10°C / 14°F so should survive winter well in most parts of the UK. This is dependent on how protected the plant is from strong winds. Those in exposed situations may suffer at that temperature whereas those in protected positions can tolerate temperatures a couple of degrees lower. 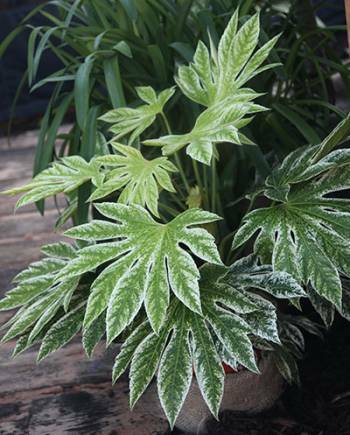 The variegated form (Fatsia japonica 'Variegata') is far less hardy and should be avoided for planting outside unless you live in a particularly warm part of the UK. They are low maintenance shrubs. See "Caring for Fatsias" below for more details. Fatsia japonica looks good as a stand alone specimen plant against a wall or fence. They are excellent as background plants or mixed with other evergreen plants. We particularly like them paired with Choisya ternata 'Sundance'. This shrub has been given an Award of Garden Merit (AGM) by the Royal Horticultural Society. Two varieties of this shrub are readily available online in the UK. The first is the original Fatsia japonica and the second is a new variety called Fatsia japonica 'Spiders Web' (see below). Our recommended online supplier for this shrub is Crocus, click here for their page featuring both varieties. This is a new Fatsia variety which is the same as the original Fatsia except that the leaves are variegated. The normally green leaves are streaked with grey / white, typically at the margins but this depends on the growing conditions. It also produces the same interesting, although rather insignificant, flowers in autumn time. One other difference, which may suit those with smaller gardens or container growth, is that 'Spiders Web' grows slower compared to the original variety. It also reaches a smaller maximum size at maturity, normally 2.5m / 8ft height and spread. This can easily be restricted with an annual prune. This variety is available from our approved supplier Crocus, by clicking here. Initial findings indicate that frost hardiness is the same as Fatsia japonica although insufficient data exists to be 100% sure of this. Make sure to buy plants which have been hardened off for the garden and not for the house / conservatory. Choose a position in partial or full shade. Allow at least 2m / 6ft for the plant to grow. It is best planted in spring or early autumn time when soil is warm but there is sufficient natural rainfall to avoid the need for watering. When established a Fatsia japonica will look after itself. It only needs watering in drought conditions. Feed with a good handful of blood, fish and bone in April and August. In July and August some of the leaves often turn yellow, these should be removed along with their stems. As the shrub ages, occasionally remove any stems which have become bare and straggly. New shoots will quickly reappear from the base to take their place. Prune to the required height and shape (no special techniques required) each year in late Spring. Overgrown plants can be pruned to less than half their height and width and will soon grow back. For younger plants up to two years old, water if conditions become dry. A twice yearly feed with blood, fish and bone in spring and autumn will help it to establish a good root system. Keep the area around the base of the plant free from weeds and grass. There are no common pests or diseases of this plant. The plant should be fed monthly between mid March to mid August with a handful of blood, fish and bone. It will of course require regular watering. Wait each time until the top 3cm of the compost is dry and then water well. The larger the pot the better for this plant outside, fill with normal multi-purpose compost. The best pot / container size for a new Fatsia japonica is about 60cm wide and tall. After two or tree years, repot into a slightly larger pot. To maintain it to a compact size, simply prune as described above but slightly more aggressively. A new variety of Fatsia has been marketed recently called Fatsia japonica 'Spiders Web' which has variegated foliage. It has the benefit that it is grows slower than the normal variety and also reaches a smaller size at maturity. See our description above.